Aubrey Huff (#17) celebrates after Miguel Tejada of the San Francisco Giants hit the game winning hit in the ninth inning against the St. Louis Cardinals at AT&T Park on April 9. Miguel Tejada galloped around first base like his old Oakland self of a decade ago, thrilled to produce his first game-winning hit for the World Series champion Giants. Tejada hit a two-run double that glanced off the glove of center fielder Colby Rasmus with two outs in the ninth inning and San Francisco rallied late for the second straight day, beating the St. Louis Cardinals 3-2 on Saturday night a few hours after receiving its World Series rings. And, after this dramatic finish, manager Bruce Bochy considered letting his new shortstop sport the ring for a little while. "I'm really happy right now," said the 36-year-old Tejada, due to get the day off Sunday. "I'm going to enjoy the moment. I just need to be aggressive. I'm an aggressive hitter." 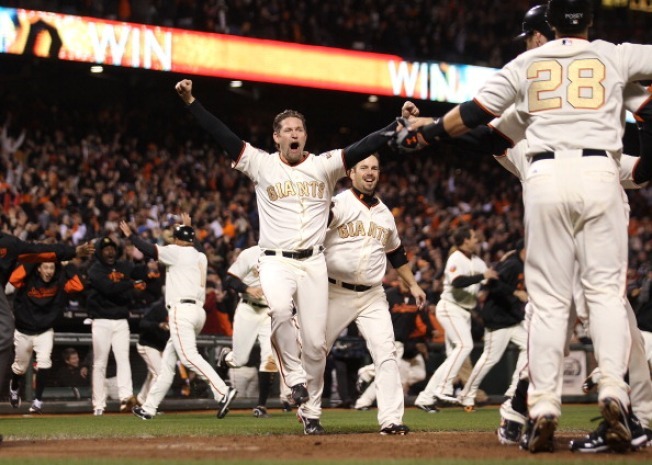 The Giants celebrated this one as though they had just won the championship all over again, with ace Tim Lincecum among those who sprinted out of the dugout to hug Tejada. Tejada skipped in jubilation after his 15th career game-ending hit. It came against Cardinals closer Ryan Franklin (0-1), who blew his third save in four chances and second in two days. St. Louis lost 5-4 in 12 innings Friday. "When you win games like this early it has a little bit of a carryover," Pat Burrell said. "We had the right guy up at the right time. He's a pro. He's been doing this so long. You want him up in a situation like that." Ramon Ramirez (1-0) pitched the ninth for the win and San Francisco secured its first series victory of the season. Franklin allowed Buster Posey's one-out single and then a walk to Burrell. Aaron Rowand flied out to bring up Tejada, who fouled off pitches down each base line before coming through with the big hit off a fastball. "I'm just having a rough time right now. I'm doing everything I think I can," Franklin said. "I threw some pitches in and some pitches out and I tried to throw the fastball in and it wasn't where I wanted it." Rasmus ran down Tejada's high drive at the edge of the warning track in left-center, but tried to catch it by his hip and the ball deflected off his glove to the ground. Both runners scored easily. "It definitely ruined my evening," Rasmus said. "I felt like I got a real good jump on it."